Wrong or incomplete information? Let us know! The initial assignment for the Villa SK was to rebuild with a rather limited budget an existing single family house and adjust it to the needs of its futures inhabitants. Instead of redeveloping the old structure, the decision was to add a contrasting annex that would extend the living area of the house into the garden. This choice allowed keeping intact the main structure of the existing construction and reserving it for the private functions, such as bathrooms and rooms for the children. On the other hand, the most public function of the house – the living room – is now surrounded by nature and becomes the central element of the house. The first floor of the existing house is now a more reserved area for the owners and the roof of the annex serves as an exterior terrace. The extension volume consists of three materials—large glass panes, rough brick and red coloured concrete. The concrete structure that forms the roof is composed by two major beams, which extent almost to the limit of the plot. Although supported by thin metal elements, the roof structure appears to hover over the rough stone wall, creating a clear but delicate contrast between these elements and materials. In this gesture, the building embraces the existing walnut tree, forming a calm and reserved courtyard. The wide glass panes provide an intimate connection from the interior space with the outside scene, from spring’s lush greenery to winter’s bright snow. 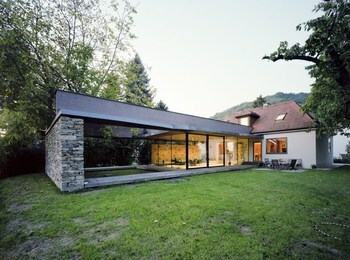 In this way, nature and architecture are interwoven to create a welcoming and harmonious backdrop for family life.